Amritsar historically also known as Rāmdāspur and colloquially as Ambarsar, is a city in north-western part in India and the administrative headquarters of the Amritsar district in the state of Punjab.It is home to the Harmandir Sahib (commonly known as the Golden Temple), the spiritual and cultural center for the Sikh religion. This important Sikh shrine attracts more visitors than the Taj Mahal with more than 100,000 visitors on week days alone and is the most popular destination for non-resident Indians (NRI) in the whole of India. 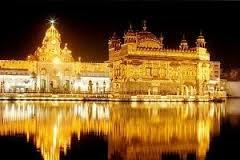 The city also houses the Akal Takht, the highest seat of earthly authority of the Khalsa, and the committee responsible for the upkeep of Gurdwaras. The city is known for its rich cuisine and culture, and for the Jallianwala Bagh massacre in 1919 under British Rule. Harmandir Sahib or the Golden Temple, Gobindgarh Fort, Jallianwala Bagh, Wagah Border, Maharaja Ranjit Singh Garden, Maharaja Ranjit Singh Museum, Ram Bagh Garden, Ram Tirath Temple, Durgiana Temple.